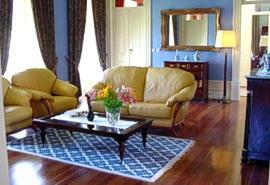 Accommodation at Quinta da Foz dos Castelhanos. 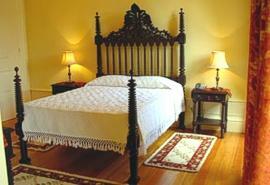 Quinta da Foz dos Castelhanos is located in the village of Barroselas in the beautiful Minho region of North Portugal. It is within easy access to the local beaches and interesting towns such as Viana do Castelo, Ponte de Lima and Braga. The “Quinta” is known to exist since 1800 and it is referred to by the locals simply as Quinta da Foz. The main house was built by the son of the first owners who was an immigrant in Brazil. For that reason the house has many architectural traces of the typical Brazilian construction of the 19th century. From the house there are delightful views over the property and the surrounding area. Moved by his love for nature and for the rural environment the owner decided to provide the property with all the facilities, quality and comfort to accommodate guests maintaining however its main features and architecture. The garden is well taken care of with beautiful, lawned areas. There is one twin and five double bedrooms all comfortably furnished and equipped with satellite television, central heating, radio, telephone and hair dryer. The twin bedroom has access to a separate shower room and the double bedrooms all have ensuite shower rooms. 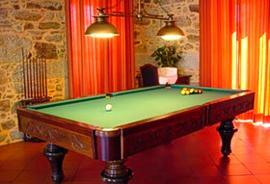 Facilities in Quinta da Foz dos Castelhanos Portugal include a games room, with pool table, and a sitting room with television. Guests also have access to the swimming pool, measuring 7 by 14 meters, which is just a few meters away from the main house. By the pool there is a changing room with shower. A trip to nearby Barcelos market is not to be missed. Held every Thursday, it is one of the largest in Europe. You can buy anything from a pair of socks to a yoke for your ox, and it’s a great place to soak up the true market atmosphere and practice your haggling skills. The historic old port of Viana do Castelo is approximately eighteen kilometres to the north. This elegant town has narrow cobbled streets of balconied houses, a marina, and lots of good inexpensive restaurants in which to sample the typical Minho cuisine together with the local Vinho Verde wine. In the garden there is a barbecue area, ideal for outdoor eating. Meals may be served if ordered with at least 24 hours in advance. In the property there is also a two bedroom cottage and a three bedroom cottage available for renting. For golfing parties there are courses at Quinta da Barca and Estela and Ponte de Lima all within easy reach by car.